An artist's illustration of the pulsar PSR B0943+10, a spinning star 3,000 light-years from Earth that shifts between beaming out X-rays and radio waves. Scientists have discovered a puzzling spinning star that is spontaneously switching between two very different personalities, flipping between emitting strong X-rays and emitting intense radio waves. While radio frequencies are known to vary as the star changes personalities, the newfound star is the first time example of variability in X-rays as well. The star, called a pulsar because it appears to pulse, has astronomers perplexed. "When we look now to what is so far published in papers, nothing at this moment can explain what is happening," said the study's lead author, Wim Hermsen of the Netherlands Institute for Space Research and the University of Amsterdam. Hermsen and his multinational research team suspect that changes in the spinning star's magnetosphere, or magnetic environment, are behind the switches. Those changes, however, is poorly understood. The newfound pulsar is officially known as PSR B0943+10. The 5 million-year-old spinning star whips through a rotation every 1.1 seconds — which is considered pretty slow for a star of its type, researchers said. PSR B0943+10's radio pulses can change as quickly as once a second. The pulsar — about 3,000 light-years from Earth — also emits a weak X-ray signal as charged particles radiate along magnetic lines and bombard the magnetic poles. Hermsen's team was interested in knowing whether the X-rays — like the radio pulses — varied between the two modes. They examined the pulsar using a European Space Agency X-ray space telescope, XMM-Newton, and combined those observations with work done at ground telescopes in the Netherlands and India. They were surprised to find the pulsar switched between giving off strong radio pulses and emitting stronger X-rays. The mode switches took place at times ranging between half an hour and about five or six hours. "The behavior of this pulsar is quite startling. It's as if it has two distinct personalities," said study co-author Ben Stappers, who is with the University of Manchester's School of Physics and Astronomy. "As PSR B0943+10 is one of the few pulsars also known to emit X-rays, finding out how this higher energy radiation behaves as the radio changes could provide new insight into the nature of the emission process." The research is detailed in the Jan. 25 edition of the journal Science. The researchers say the pulsar's quick switching between radio and X-ray brightness implies large changes in the magnetosphere. But what drives these changes is not known. 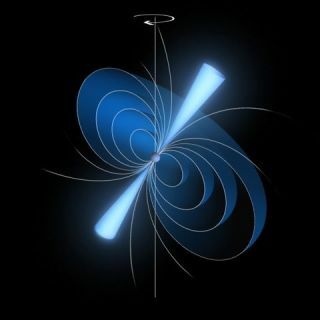 Changes in a pulsar's spin, the Science paper cautioned, are detectable only over a period of days. The research, however, suggests the magnetosphere may change in less time than it takes PSR B0943+10 to complete a single rotation. Hermsen's team plans to compare the pulsar with similar objects to try to predict the X-ray emission behavior. Later this year it plans to look at another pulsar, PSR B1822-09, in both X-ray and radio wavelengths. PSR B1822-09 will be observed with ground telescopes in India, the United Kingdom and the Netherlands along with the XMM-Newton space observatory.